An alternator is an electrical generator that converts mechanical energy to electrical energy in the form of alternating current. For reasons of cost and simplicity, most alternators use a rotating magnetic field with a stationary armature. Occasionally, a linear alternator or a rotating armature with a stationary magnetic field is used. In principle, any AC electrical generator can be called an alternator, but usually the term refers to small rotating machines driven by automotive and other internal combustion engines. An alternator that uses a permanent magnet for its magnetic field is called a magneto. Alternators in power stations driven by steam turbines are called turbo-alternators. Large 50 or 60 Hz three-phase alternators in power plants generate most of the world's electric power, which is distributed by electric power grids. 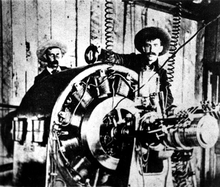 In what is considered the first industrial use of alternating current in 1891, workmen pose with a Westinghouse alternator at the Ames Hydroelectric Generating Plant. This machine was used as a generator producing 3000-volt, 133-hertz, single-phase AC, and an identical machine 3 miles away was used as an AC motor. Alternating current generating systems were known in simple forms from the discovery of the magnetic induction of electric current in the 1830s. Rotating generators naturally produced alternating current but, since there was little use for it, it was normally converted into direct current via the addition of a commutator in the generator. The early machines were developed by pioneers such as Michael Faraday and Hippolyte Pixii. 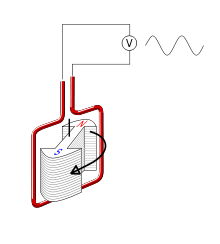 Faraday developed the "rotating rectangle", whose operation was heteropolar – each active conductor passed successively through regions where the magnetic field was in opposite directions. Lord Kelvin and Sebastian Ferranti also developed early alternators, producing frequencies between 100 and 300 Hz. The late 1870s saw the introduction of first large scale electrical systems with central generation stations to power Arc lamps, used to light whole streets, factory yards, or the interior of large warehouses. Some, such as Yablochkov arc lamps introduced in 1878, ran better on alternating current, and the development of these early AC generating systems was accompanied by the first use of the word "alternator". Supplying the proper amount of voltage from generating stations in these early systems was left up to the engineer's skill in "riding the load". In 1883 the Ganz Works invented the constant voltage generator that could produce a stated output voltage, regardless of the value of the actual load. The introduction of transformers in the mid-1880s led to the widespread use of alternating current and the use of alternators needed to produce it. After 1891, polyphase alternators were introduced to supply currents of multiple differing phases. Later alternators were designed for various alternating current frequencies between sixteen and about one hundred hertz, for use with arc lighting, incandescent lighting and electric motors. Specialized radio frequency alternators like the Alexanderson alternator were developed as longwave radio transmitters around World War 1 and used in a few high power wireless telegraphy stations before vacuum tube transmitters replaced them. Diagram of a simple alternator with a rotating magnetic core (rotor) and stationary wire (stator) also showing the current induced in the stator by the rotating magnetic field of the rotor. A conductor moving relative to a magnetic field develops an electromotive force (EMF) in it (Faraday's Law). This EMF reverses its polarity when it moves under magnetic poles of opposite polarity. Typically, a rotating magnet, called the rotor turns within a stationary set of conductors wound in coils on an iron core, called the stator. The field cuts across the conductors, generating an induced EMF (electromotive force), as the mechanical input causes the rotor to turn. The rotating magnetic field induces an AC voltage in the stator windings. Since the currents in the stator windings vary in step with the position of the rotor, an alternator is a synchronous generator. The rotor's magnetic field may be produced by permanent magnets, or by a field coil electromagnet. Automotive alternators use a rotor winding which allows control of the alternator's generated voltage by varying the current in the rotor field winding. Permanent magnet machines avoid the loss due to magnetizing current in the rotor, but are restricted in size, due to the cost of the magnet material. Since the permanent magnet field is constant, the terminal voltage varies directly with the speed of the generator. Brushless AC generators are usually larger than those used in automotive applications. An automatic voltage control device controls the field current to keep output voltage constant. If the output voltage from the stationary armature coils drops due to an increase in demand, more current is fed into the rotating field coils through the voltage regulator (VR). This increases the magnetic field around the field coils which induces a greater voltage in the armature coils. Thus, the output voltage is brought back up to its original value. is the rotational speed in revolutions per minute (RPM). Very old descriptions of alternating current systems sometimes give the frequency in terms of alternations per minute, counting each half-cycle as one alternation; so 12,000 alternations per minute corresponds to 100 Hz. Alternators may be classified by method of excitation, number of phases, the type of rotation, cooling method, and their application. There are two main ways to produce the magnetic field used in the alternators, by using permanent magnets which create their own persistent magnetic field or by using field coils. The alternators that use permanent magnets are specifically called magnetos. In other alternators, wound field coils form an electromagnet to produce the rotating magnetic field. A device that uses permanent magnets to produce alternating current is called a permanent magnet alternator (PMA). A permanent magnet generator (PMG) may produce either alternating current, or direct current if it has a commutator. This method of excitation consists of a smaller direct-current (DC) generator fixed on the same shaft with the alternator. The DC generator generates a small amount of electricity just enough to excite the field coils of the connected alternator to generate electricity. A variation of this system is a type of alternator which uses direct current from the battery for initial excitation upon start-up, after which the alternator becomes self-excited. This method depends on residual magnetism retained in the iron core to generate weak magnetic field which would allow a weak voltage to be generated. This voltage is used to excite the field coils for the alternator to generate stronger voltage as part of its build up process. After the initial AC voltage buildup, the field is supplied with rectified voltage from the alternator. A brushless alternator is composed of two alternators built end-to-end on one shaft. Smaller brushless alternators may look like one unit but the two parts are readily identifiable on the large versions. The larger of the two sections is the main alternator and the smaller one is the exciter. The exciter has stationary field coils and a rotating armature (power coils). The main alternator uses the opposite configuration with a rotating field and stationary armature. A bridge rectifier, called the rotating rectifier assembly, is mounted on the rotor. Neither brushes nor slip rings are used, which reduces the number of wearing parts. The main alternator has a rotating field as described above and a stationary armature (power generation windings). Another way to classify alternators is by the number of phases of their output voltage. The output can be single phase, or polyphase. Three-phase alternators are the most common, but polyphase alternators can be two phase, six phase, or more. The revolving part of alternators can be the armature or the magnetic field. The revolving armature type has the armature wound on the rotor, where the winding moves through a stationary magnetic field. The revolving armature type is not often used. The revolving field type has magnetic field on the rotor to rotate through a stationary armature winding. The advantage is that then the rotor circuit carries much less power than the armature circuit, making the slip ring connections smaller and less costly; only two contacts are needed for the direct-current rotor, whereas often a rotor winding has three phases and multiple sections which would each require a slip-ring connection. The stationary armature can be wound for any convenient medium voltage level, up to tens of thousands of volts; manufacture of slip ring connections for more than a few thousand volts is costly and inconvenient. Many alternators are cooled by ambient air, forced through the enclosure by an attached fan on the same shaft that drives the alternator. In vehicles such as transit buses, a heavy demand on the electrical system may require a large alternator to be oil-cooled. In marine applications water-cooling is also used. Expensive automobiles may use water-cooled alternators to meet high electrical system demands. Most power generation stations use synchronous machines as their generators. Connection of these generators to the utility grid requires synchronization conditions to be met. Until the 1960s, automobiles used DC dynamo generators with commutators. With the availability of affordable silicon diode rectifiers, alternators were used instead. In later diesel electric locomotives and diesel electric multiple units, the prime mover turns an alternator which provides electricity for the traction motors (AC or DC). The traction alternator usually incorporates integral silicon diode rectifiers to provide the traction motors with up to 1200 volts DC (DC traction, which is used directly) or the common inverter bus (AC traction, which is first inverted from dc to three-phase ac). The first diesel electric locomotives, and many of those still in service, use DC generators as, before silicon power electronics, it was easier to control the speed of DC traction motors. Most of these had two generators: one to generate the excitation current for a larger main generator. Optionally, the generator also supplies head end power (HEP) or power for electric train heating. The HEP option requires a constant engine speed, typically 900 RPM for a 480 V 60 Hz HEP application, even when the locomotive is not moving. Marine alternators used in yachts are similar to automotive alternators, with appropriate adaptations to the salt-water environment. Marine alternators are designed to be explosion proof so that brush sparking will not ignite explosive gas mixtures in an engine room environment. They may be 12 or 24 volt depending on the type of system installed. Larger marine diesels may have two or more alternators to cope with the heavy electrical demand of a modern yacht. On single alternator circuits, the power may be split between the engine starting battery and the domestic or house battery (or batteries) by use of a split-charge diode (battery isolator) or a voltage-sensitive relay. High frequency alternators of the variable-reluctance type were applied commercially to radio transmission in the low-frequency radio bands. These were used for transmission of Morse code and, experimentally, for transmission of voice and music. In the Alexanderson alternator, both the field winding and armature winding are stationary, and current is induced in the armature by virtue of the changing magnetic reluctance of the rotor (which has no windings or current carrying parts). Such machines were made to produce radio frequency current for radio transmissions, although the efficiency was low. ^ "Abraham Ganz at the Hindukush". Poemas del río Wang. Studiolum. Archived from the original on 11 February 2016. Retrieved 30 September 2015. ^ "List of Plug/Sockets and Voltage of Different Countries". World Standards. World Standards. ^ "Milestones:Ames Hydroelectric Generating Plant, 1891". IEEE Global History Network. IEEE. Retrieved 29 July 2011. ^ Thompson, Sylvanus P., Dynamo-Electric Machinery. p. 7. ^ Thompson, Sylvanus P. "Milestones:Alternating Current Electrification, 1886". IEEE Global History Network. Retrieved 22 September 2013. ^ a b c d e Aviation Maintenance Technician Handbook—General (FAA-H-8083-30) (PDF). Federal Aviation Administration. 2008. pp. 10_160–10_161. Archived from the original (PDF) on 6 September 2013. Retrieved 6 September 2013. Wikimedia Commons has media related to Alternators. White, Thomas H.,"Alternator-Transmitter Development (1891–1920)". EarlyRadioHistory.us.